This Valentine’s Day, we’re encouraging you to give the special woman in your life an item that doesn’t melt away or die within days. That’s where smartwatches come in — both hybrid and touchscreen. If you’re unfamiliar with the term, be sure to check out our hybrid smartwatch guide. Both types of smartwatches are not only stylish and customizable, but are something she’ll be able to use on a daily basis, whether it’s for tracking health and activity, staying on top of alerts and notifications, or keeping up with her busy schedule. Overwhelmed with all of the options? Don’t panic, we’re here to help. Regardless of fashion preferences or lifestyle, we’ve got the perfect picks for all the ladies out there (or check out our guide to the most stylish smartwatches for men). Here are the best smartwatches for her on Valentine’s Day. At first glance, the Fossil Q Venture looks like a bit much with its all-around gemstone detail and rose gold color. But this 1.2-inch AMOLED touchscreen smartwatch packs a lot of features into a thin, lightweight device that looks flattering on the wrist. Running Android Wear 2.0, the Q Venture syncs to your special someone’s smartphone via Bluetooth, which allows her to receive app notifications, as well as answer calls, text messages, and more. With both Google Fit and Google Fit Workout built-in, she can also track her steps and calories burned, and log a variety of different workouts. We enjoyed the pre-installed games, like Bold Bot and Maze, which can become weirdly addicting if she’s ever bored. 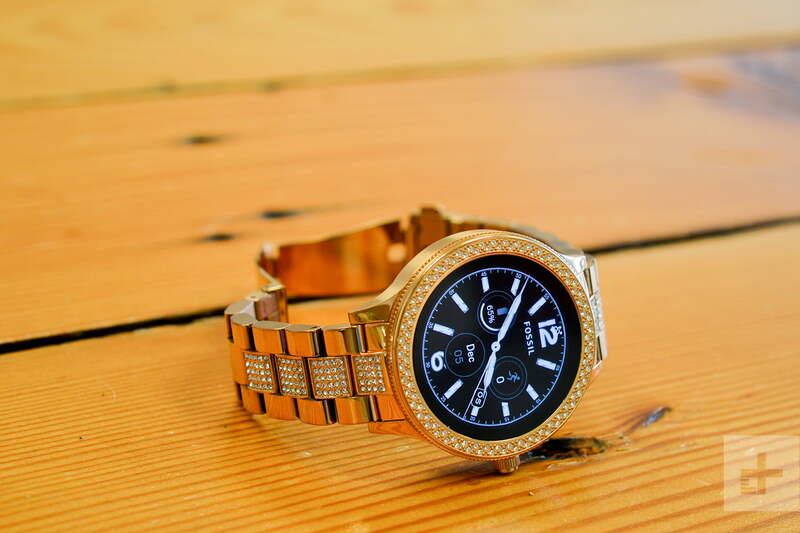 If you know she’d rather have a more casual-looking watch than a glamorous and glitzy one, you’re in luck. 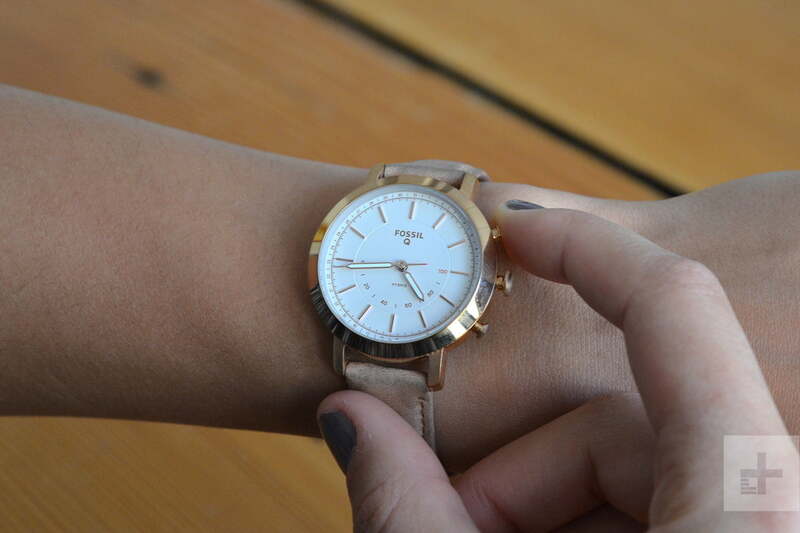 Fossil’s Q Venture comes in a lot of different colorways to suit anyone’s style. There’s a ton of stainless steel options in silver, gold, and rose gold without the gemstones. There’s also rose gold with a sand leather watch strap and an all-black model with a silicone watch strap. The smartwatch is also interchangeable with any 18mm straps from Fossil’s collection, in case she wants to change up her look. To tailor the watch even further, Android Wear 2.0 comes with preset watch faces that she can customize based on color and settings. The Kate Spade Scallop is certainly the quirkiest option on our list. This doesn’t come as a surprise, since Kate Spade is known for never shying away from bright colors and playful prints — and this smartwatch is no different. The name originates from its design, which features a scalloped edge on the bezel — a unique change from what other designers are doing. The smartwatch features a 1.9-inch touchscreen — bigger than most watch faces available for women — and a slim case that could easily fit under her sleeve without looking too bulky. As for color variants, the Scallop comes in three different options. For $255, you can choose between a black or tan leather watch strap, which both come with a rose gold case. If you’re looking to splurge a bit more, there’s also the rose gold stainless steel option for $325. Even though Android Wear is compatible with iOS, you’re still limited in your capabilities. If your significant other is a loyal iPhone user, you can’t go wrong with an Apple Watch — especially the latest model, the Apple Watch Series 4. It holds our No. 1 spot as the best smartwatch out there so far. With an easy-to-use interface and the ability to receive all her app notifications, as well as answer text messages, she won’t feel as restricted. If you really want to be the ultimate Valentine’s Day hero, you can opt for the Apple Watch Series 4 with 4G LTE which has a built-in eSIM. That means she’ll be able to connect to a cellular network and use the smartwatch to make phone calls and answer incoming ones. But with LTE, there’s also the additional $10 monthly charge from your carrier. There are also tons of personalization options when it comes to the Apple Watch. For starters, she’ll be able to choose from a large variety of watch faces — including several new ones that were added to the Series 4 model such as the stunning animated fire, vapor, and liquid metal faces. She can change around the watch straps as well, with plenty of options from Apple itself or third-parties. We personally like the Coach Apple Watch Strap with Rexy for $150 — its brown leather is not only traditional, but that cute little dinosaur will make anyone smile. The Apple Watch Series 4 offers several different models. For the basic aluminum model with GPS only and a regular Sport Band, it’ll cost you $400. If you choose to get the same model with GPS and cellular, along with the Sport Band or Sport Loop strap, it’s a bit more expensive at $500. These prices apply to the 40mm, so you’ll be paying an additional $30 for the larger, 44mm model. The watch becomes more pricey for the other two models — the stainless-steel with a sapphire crystal watch face will run you $700, and the Milanese Loop strap adds another $100. The Skagen T-Bar Hybrid is the perfect option if you want to buy her a classic and traditional-looking watch. Skagen is well-known for its devotion to minimalist watch designs that look clean and sophisticated. The T-Bar comes in several different color options — rose gold steel-mesh, silver steel-mesh, gray leather, and black leather. While the wrist straps aren’t interchangeable, each colorway is simple enough to easily match with any type of style, so it won’t be difficult for her to match it with both casual outfits and evening wear. 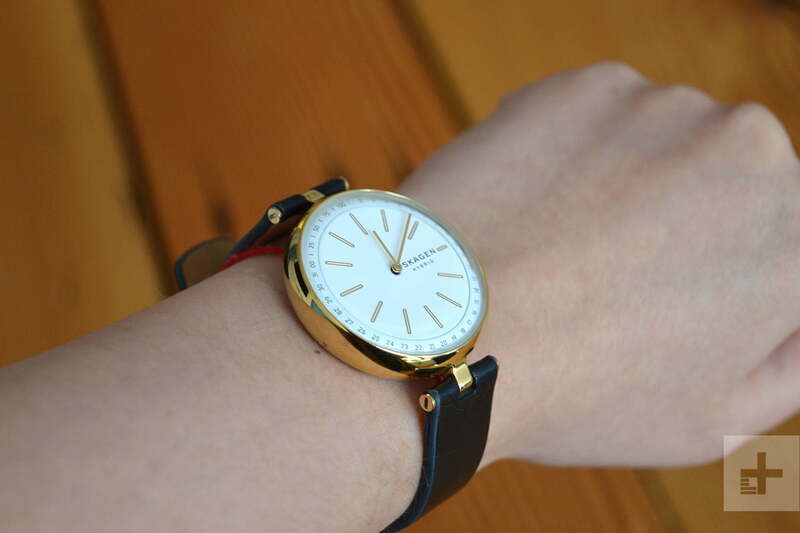 Our review model had the stainless steel gold case and black watch strap, and we loved how thin and lightweight it felt. We especially liked that while other hybrid smartwatches tend to have larger bezels, Skagen’s 36mm watch face looks almost bezel-less. To add to the elegance and airy feel, the T-Bar’s crown is replaced by a large, flat button along with two smaller flat buttons. With a watch face made of mineral crystal, she’ll also be happy to know that it’s scratch-resistant — giving her the green light to wear it more often than not. 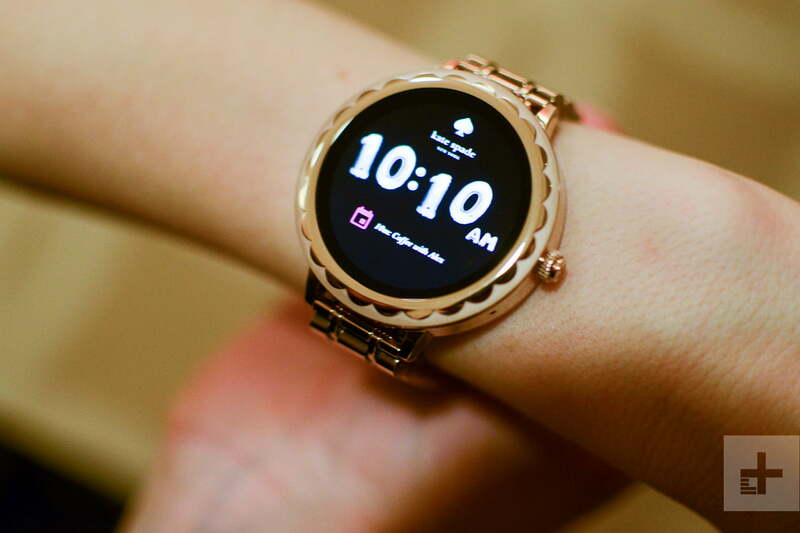 For this hybrid smartwatch, she’ll be able to use the Skagen Connected app available for iOS and Android, which allows her to track her fitness and activity. As for notifications, she’ll have the option of choosing six notifications and/or apps to assign numbers to. Whenever she receives an alert, the watch dials will automatically point to the number she’s assigned, so she won’t have to check her smartphone each time she has a notification. Michele is known for producing luxurious watches, and its Michele hybrid smartwatch is no different. While it’s one of the more expensive choices on this list, that’s the price you pay for a high-quality device. With a watch face made of sapphire crystal, the Michele hybrid is highly scratch-resistant and durable, so it’ll last her for years. Each watch face is also attached to an alligator strap with an inner silicone lining, which — unlike some other straps on the market — doesn’t easily crack or look worn out after consistent wear. The silicone lining on the inside of the watch strap also adds to the comfort. If she wants to switch it up, the straps are interchangeable with any other 18mm strap from the Michele Collection. We reviewed the all-black model, which did look a bit sportier than others, but it still easily transitioned between day and nightwear. Other color options include two-tone white and navy, navy and gold, and rose gold tone with gray. The 38mm stainless steel case is much bigger than most women’s smartwatches on the market — which also means it’s also heavier and thicker. But we liked the bulkier look since it made the watch look less delicate and like more of a statement piece. Our favorite part of the smartwatch design was the splash of red on the rotating watch crown and on the watch face, which subtly ties in Michele’s signature logo. 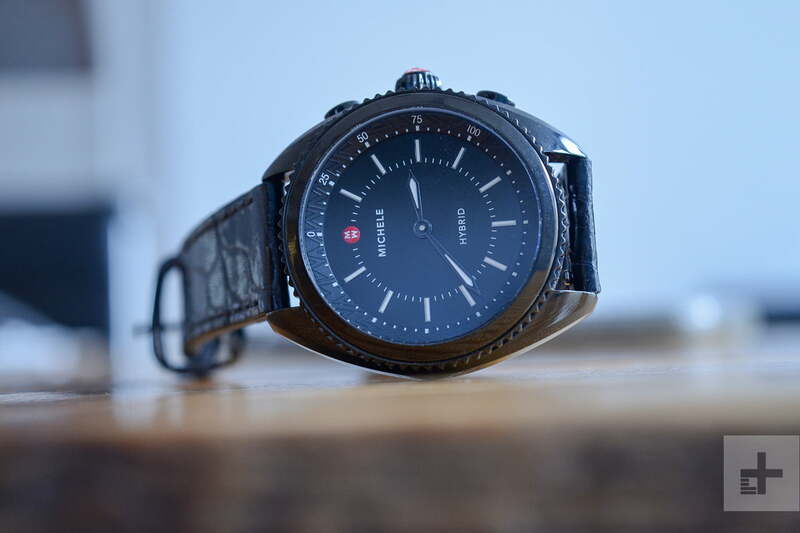 Similar to the Skagen T-Bar Hybrid, the Michele hybrid runs on its own Michele Connected app for iOS and Android. It’s also capable of tracking health and activity, as well as alerting you when you receive notifications. The Fossil Q Neely is the smallest hybrid smartwatch in Fossil’s lineup. If you’re looking for a watch that isn’t too bulky and heavy to fit a smaller wrist, the Q Neely is a great choice. With a 36MM case and a thickness of 12MM, it’s the same size as the Skagen T-Bar but has thicker bezels that look stunning under the light. For such a thin, lightweight smartwatch, she might find it hard to believe that it has smart features. Fossil’s Q Neely runs on the Fossil Q app and includes the exact same features as the other hybrid smartwatches on this list. Its new Commute feature is the one differentiating factor — which she’ll love when traveling to different destinations. By adding her address into the Fossil Q app — such as work or home — she can assign it to one of the three buttons on the side. Whenever she pushes the button, it will use Google Maps to calculate her arrival time or how long her commute will take, which the watch hands will show. The Q Neely is available in three color variants — a rose gold case with a bone leather or cabernet leather watch strap and a silver case with a black leather watch strap. It’s also interchangeable with any other 16mm watch strap in Fossil’s collection, which could make for a great add-on if you’re looking to give more than one gift.